class="post-template-default single single-post postid-331018 single-format-standard group-blog masthead-fixed full-width singular wpb-js-composer js-comp-ver-5.7 vc_responsive"
Governor Ricketts, the Nebraska trade delegation, and Mexican officials and business representatives at a lunch hosted by Rassini. Governor Pete Ricketts and his trade delegation completed a successful, three-day trade mission to Mexico City. Members of the 25-person trade delegation represented Nebraska agriculture, agribusinesses, higher education, and economic development. During the trade mission, the delegation thanked Mexico for trade in the past, expressed hope for a new trade deal in the near future, and explored opportunities to expand exports of both agricultural and manufacturing products from the United States and Nebraska. Nebraska Department of Agriculture (NDA) Director Steve Wellman, who accompanied Governor Ricketts on the trade mission, stressed the importance of growing agricultural trade opportunities in Mexico. 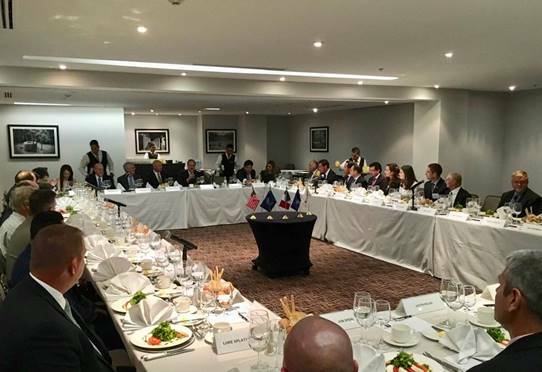 Upon arriving in Mexico City, the delegation met with several business leaders at a luncheon hosted by Eugenio Madero, CEO of Rassini, a major manufacturing company. Following the luncheon, the U.S. Embassy hosted a staff briefing and reception giving the Nebraska delegates an opportunity to discuss issues with Embassy staff. On day two of the trade mission, the delegation toured the Preferred Popcorn-owned facility outside of Mexico City and attended meetings with the Governor of the State of Mexico and other government officials. The U.S. Grains Council hosted a briefing and luncheon for the delegation that was attended by representatives from all the major associations who are current customers that are purchasing agricultural products from Nebraska. In the evening, Governor Ricketts and the delegation attended a reception at the U.S. Embassy’s Residence with more than 100 Mexican industry and government representatives in attendance. Day three included a tour of SENASICA (the National Service for Agroalimentary Public Health, Safety and Quality and counterpart of USDA’s Animal and Plant Health Inspection Service). The delegation had a breakfast meeting with SENASICA officials and lunch with U.S. Meat Export Federation (USMEF) members and Comecarne Mexican meat industry members and importers. The delegation included the following organizations: Nebraska Governor’s Office, Nebraska Department of Agriculture, Nebraska Department of Economic Development, Nebraska Soybean Board, Nebraska Soybean Association, Nebraska Beef Council, Nebraska Sorghum Board, Nebraska Corn Board, Nebraska Dry Bean Commission, Nebraska Pork Producers, Nebraska Wheat Board, Nebraska Farm Bureau, Preferred Popcorn, New Alliance Bean Co-op, Bruckman Rubber, Innovative Prosthetics, and the University of Nebraska–Omaha.